Biggest size turbo ran on ramhorn w/ AC?! Like the title states, trying to see what the biggest turbo is someone ran while keeping Ac on a ramhorn. I have a gt35r I plan on using and it clears no problem but someone has a comp triple ball bearing 67/72 custom turbo for a good deal locally and wondering if it would fit, I wouldn't mind notching the block either, I already have my downpipe and everything. If it would fit I would make the switch. Re: Biggest size turbo ran on ramhorn w/ AC?! 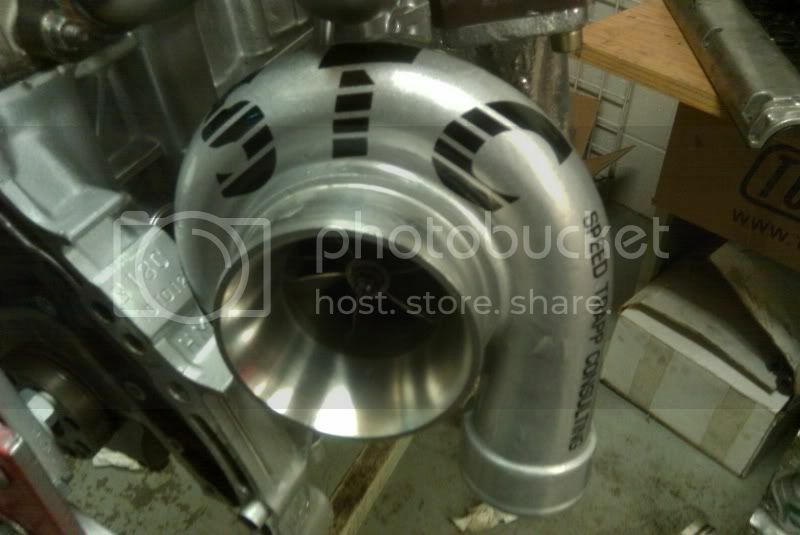 I realize that but since the car is built for the street at the moment if I could pick up this turbo for the deal hes giving on it & still be able to use it with ac then why not? 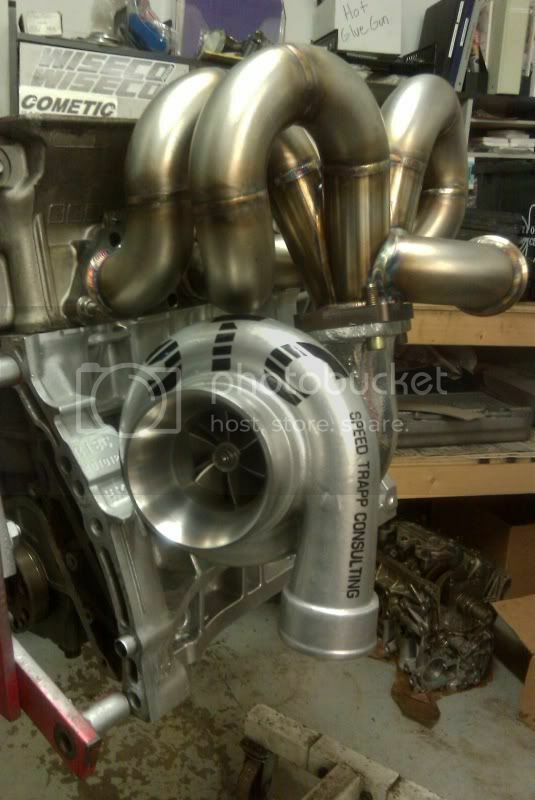 future goals are to use my built motor in a different shell with a top mount setup and hood exit exhaust, etc... but im asking to see if anyone else did a big turbo while keeping AC. Eventually will be getting Boost By Gear Setup but want to get the car running and tuned on low boost before I go make some changes such as some Pro 1 cams or GSC T1's down the road, 340lhp Fuel Pump, 1600cc Inj, -6an Fuel line from tank to front, Hondata CPR setup. Car is also going RHD down the road after the setup is all set and making 500+hp on pump with AC & PS. And what do you plan to start out making with that gigantic Comp turbo? The largest you can fit is a T04S cover. Many companies that utilize Garrett/Turbonetics styled platform go by the compressor cover itself. Which is about a T04S. Here's an old picture of a T67 on Kooks-style Manifold made for A/C. We had to do so much grinding that the number plate had to be cut in order to fit. The webbing was completely down to where we almost thought that the block was compromised. And I'll put $100 on a soccer mom with a Dodge Caravan to out-accelerate you the first 1000 feet with that kind of thinking. Better yet, on second thought, make it $200. I mean, I obviously understand what you and everyone else means, but at the same time I think high hp laggy builds are little too harshly trashed on. Now, I'm still new to this and the fastest car I believe I've ever been in was an (s? )4 with 3 people in it.... yeah so I have no idea what it feels like to be fast. With gearing he'll still get into that power band very quicly, even with ls gears (depending on the speed obviously). I understand why wider powerbands are superior, however. It should be scrutinized harshly. They are hard to control, gearing is irrelevant with something that late in the powerband..
What's fun to Derek wouldn't be fun to me. Plain and simple. you want to do it, be my guest. But the amount of time you would be doing it would not be worth the risk or investment of doing so. What, you thought I never roll raced at a 140mph? I did it before YouTube even existed. 2 arrests, 7 points and a bunch of fines later.. I grew up and became an adult.. plain and simple. I'm only decent at math because I can derive pretty well. Give me the right calculations to start, and I'll find anything. Otherwise, not that great myself. As for thinking I didn't do that kind of stuff, well, that's how we become experienced in life... Starting off, doing dumb **** first. Lol. I said 400hp @ low boost. & I only had a Comp stage 3 clutch I had from my previous LS turbo build, tried selling it brand new in box for $285 and broke people trying to get it delivered for 250... Smh so I'm going to put it to use and see how it does. Trust me when my fuel system is up to par & I get a stage 5 clutch I will gladly run 500+ on pump. 600+ e85 with Ac and power steering. I'm building the car for my liking hence why I'm keeping my integra with the factory options it came with and working around it and not do like everyone else and rip everything out. Yeah maybe one day I'll pull it out and go top mount or I'll buy a junk shell and swap everything over. mmmmkay. Yes. umm. sure. Good luck to you, of course. biggest injector that can be ran with an fmu? Quick Reply: Biggest size turbo ran on ramhorn w/ AC? !